Cons: Like the title says, arrived DOA. I have always liked Asus products, but I guess their quality control has gone down hill. Stays fairly cool under as heavy a load as I can put (At most getting to ~68 C after playing with fan curve) Might also have something to do with the 8 tower fans moving air but that's the temp coming from ASUS GPU Tweak II software so take that for what you will. Cons: It's rather thick for a card, so don't expect to have [much] room for a second one. Lack of RT-enabled games make it a hard sell without a sale. Other Thoughts: I've had this card for a little over two weeks as of this review. Benchmarking has shown it to be a pretty good improvement over my 1070. I worked with my 1070 running Anthem on medium with plenty of frame dropping. Move to 2080, framerate stays comfortably at between 115 and 125 FPS on ultra. I did have to play around with the fan curve to keep the card cool without the stop and go of the temp threshold. Ended up just setting it to kick fans on at 45C and it keeps it cool during load instead of letting the temp build and having to catch up. Overall, I'm very satisfied with the card. Fair price (on sale) for what you get. Love the card. ASUS has never done wrong by me and have renewed that faith again with this card. 4/5 because of the thickness which would prevent good fan intake if there was anything sitting in the slot below it. Other Thoughts: I get lots and lots of FPS in all my games. Not much to say, if you can afford it go for it ! - Fans only come on after a certain temperature is reached, making it ideal for those who like silent builds but don't want custom (liquid) cooling loops. Cons: - MASSIVE heat sink that slightly exceeds the 2 standard mounting bracket units, I had a full tower case so was fine. But this might be a problem for some smaller case builds. Other Thoughts: Used for gaming (crushes anything at 2560x1440@60Hz) and semi-pro content creation of digital art and 3D modelling (although 8GB VRAM might be a bit limiting for large 3D models/landscapes). Pros: -A Serious performance increase from the 10 series cards. -I went from 40-50 FPS at 3440 x 1440 with two 1070s in SLI to 60-80 FPS at the same resolution and max settings. -Quiet unless at full load and the fans have to ramp up which every fan style card suffers from. Cons: - Price, the biggest drawback to the 20 series cards is the sticker shock, but let's be honest if you are looking at the top tier cards 2080, 2080ti, and now RTX Titan you know you are going to pay out the nose for them. - The card is big so in smaller cases, it may have trouble maintaining cooler temps or even fitting. - The card could look nicer I mean I am not a huge RBG guy but an all black card with a white and black backplate is will boring and for the price, some consideration could have been put into that aspect though that is a minor thing. -Ray Tracing is the future but is a letdown, hopefully, with future driver updates and better software support it will be what NVIDIA envisions, but right now you will get around 30 FPS (assuming your machine can even turn it on CPU requirements). So the concept is cool and it looks great when it works you will notice a performance drop when you turn it on. Other Thoughts: I don't know why so many people complain about how hot these cards run mine on normal load ie web browsing stays around 44C and even at full load during a 3DMark benchmark test at full loads it stays below 80C. I have a full ATX tower with three case fans, but I made sure the card has plenty of space nothing is in the PCIe slot below it. 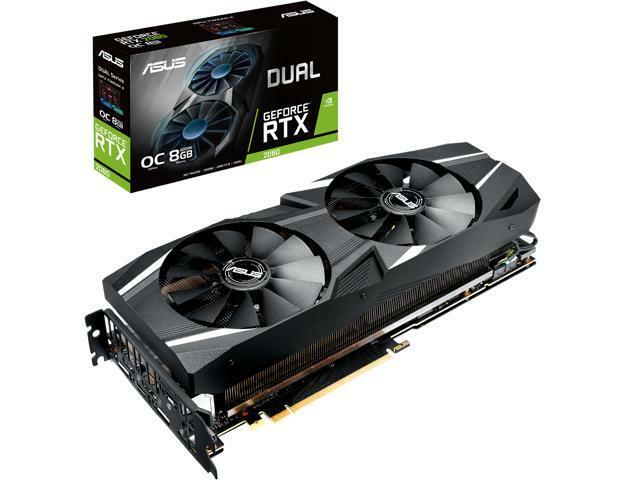 All that being said I recommend this card to anyone who wants to game in 4K or is looking for an insane performance increase over older generations. This card isn't perfect and the price is high but should DLSS and Ray Tracing iron out their issues and deliver on the potential the 20 series can be something very special. Even if Ray Tracing never fully takes off you are still getting huge performance increases in every aspect of gaming. - comes with a GPU monitor that can be configured for a graphical view of temps/ fans/ speeds of everything! also have a simple text version for in game monitoring that you can configure. - cooling block works great to get rid of heat. We all knew this GPU would run hotter then previous versions. - 8 Gb of Vram is more then enough for most games..
- GPU works with Corel suite for extra processing power. - to activate monitor there is short cut keys. when I click on GPU Tweak II button to active monitor it says shortcut key is already used by another software and monitor program comes up. - if you delete tweak II and re install it you can not take your backup of your settings and restore them you will have to manually put them back in. like fan curves, GPU/ VRAM speeds. Other Thoughts: I have a 1080 monitor so everything is maxed out and only run a few games.. this video card kicks out a lot of heat. had to put a piece of acrylic between the video cards back plate and pcb to almost opposite glass part of case and added 3 fans down the left side of back of case to stop the heat from going up in to my cosair water cooler for my CPU.. works great. Pros: It was packaged nicely. Probably would matter as much if the card functioned out of the box. Card was DEAD on ARRIVAL. Other Thoughts: I will not buy from ASUS again since these types of quality problems tend to be pervasive across product lines. One egg is too high of a rating for something that doesn't work! 5 out of 28 people found this review helpful. Did you? This card is great when it comes to demanding games, it runs everything on ultra. I'm currently using a 165hz 1440p asus rog monitor and everything looks perfect with this set up. The only thing I have an issue with is the card being over 85c+. The fans get very loud and sometimes the game tweaks out and freezes up for a second. Maybe I just have a defected card and I will be replacing this card since I do have warranty to see if its just that card. Also the display port and hdmi no signal issue is very annoying, I always have to restart my computer hoping to see if it fixes the problem. In my opinion there is probably better 2080's out there than this one, just do a bunch of research and look at the reviews. 9 out of 13 people found this review helpful. Did you?